Memorable Moments From Democratic Conventions Of The Past : Political Junkie A look at five memorable Democratic conventions of the past, beginning in 1956 — when presidential nominee Adlai Stevenson threw the decision on naming a running mate to the delegates. 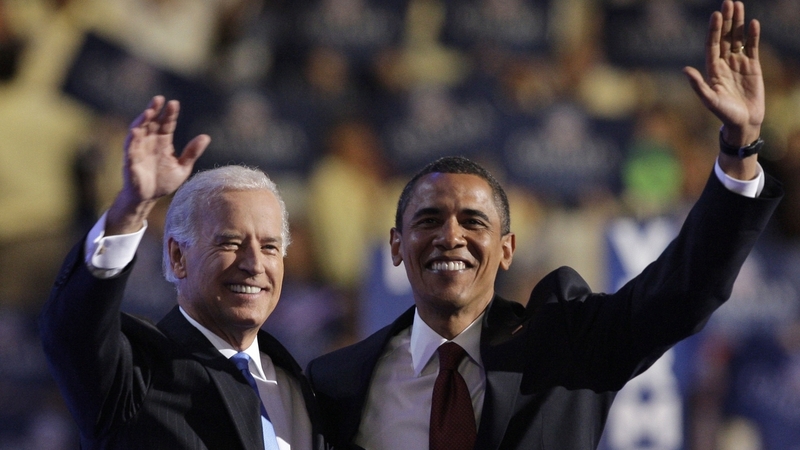 V ice President Joe Biden, left, and President Obama embrace following Biden's vice-presidential nomination acceptance speech at the Democratic National Convention in Denver, Wednesday, Aug. 27, 2008. Perhaps, when they think back to the Republican convention of 2012, it will be Clint Eastwood and his friend, the chair, that people will remember most. Not that Mitt Romney's acceptance speech was lacking. It was good. He laid out his case against President Obama and ended in a flourish. Nobody will confuse him with Ronald Reagan, but he did what he needed to do. High marks as well to Ann Romney, Paul Ryan, Condoleezza Rice and Marco Rubio, among others. But for a party that is not especially known for its spontaneity, Eastwood's antics were memorable ... if not completely baffling. And just think, once upon a time their greatest apprehension for Tampa was Donald Trump. I'm hard pressed to remember a talking chair at a Democratic convention. But talking has never been in short supply for the Dems. They talked a lot at the 1924 convention at the old Madison Square Garden, so much so that it lasted 17 days and didn't arrive at a nominee until 103 ballots were taken. Hubert Humphrey talked so much at the 1948 convention, about civil rights, that it led to a walkout by Southern delegates (who went on to nominate South Carolina Gov. Strom Thurmond for president at a States Rights convention). So many people had to have their say at the 1972 convention that nominee George McGovern didn't begin his acceptance speech until nearly 2 a.m. Nobody will ever forget the voice and solemnity of Barbara Jordan as she gave the keynote speech in 1976. At the same time, while it's hard to recall what exactly Bill Clinton was going on and on about during his 35-minute nominating speech for Michael Dukakis at the 1988 convention, everyone certainly remembers his closing words, "In conclusion ..." That got a standing ovation. Last week's column focused on memorable moments at Republican conventions of the past; this week it's the Democrats' turn. As with the GOP, I could spend forever talking about great (and not-so-great) Democratic convention moments: Adlai Stevenson walking into the 1952 convention in Chicago as an avowed non-candidate and leaving as the nominee. The stunning decision by John F. Kennedy to name his 1960 rival for the nomination, Lyndon Johnson, as his running mate. Al Gore's long kiss with then-wife Tipper Gore at the 2000 convention that went on nearly as long as the Florida recount. Barack Obama's 2004 keynote speech in Boston and his 2008 history-making nomination in Denver. 1956 (Chicago) — Four years prior Adlai Stevenson was a reluctant nominee who avoided the primaries. This year was different, as he stood toe to toe with Tennessee Sen. Estes Kefauver from the start. Stevenson's late primary victories in Florida and California proved to be significant, and he easily won the nomination on the first ballot. But he unexpectedly decided to leave the choice of his running mate up to the delegates. A mad scramble then ensued, with Sens. Kefauver, Albert Gore Sr. of Tennessee, John F. Kennedy of Massachusetts and Hubert Humphrey of Minnesota — along with Mayor Robert Wagner of New York City — all putting together makeshift campaigns with little time to reach the delegates. Kennedy was very close to winning the V.P. nomination outright on the second ballot until Gore decided to leave the contest and throw his support to Kefauver, his fellow Tennessean. That was the beginning of a Kefauver surge that put him over the top on the third ballot. Kennedy, of course, would be back, four years later. 1968 (Chicago) — An endless war was being waged in Southeast Asia, but there was considerable violence at home as well; assassinations claimed the lives of Dr. Martin Luther King Jr., who was fighting for racial equality, and Sen. Robert Kennedy, a foe of the Vietnam War who was seeking the Democratic presidential nomination. And the Chicago convention opened with two forces at loggerheads: anti-war protestors, battling with the police out in the streets, and a Democratic Party that was determined to nominate Vice President Hubert Humphrey and affirm the Johnson-Humphrey war policy. Humphrey's nomination was never in doubt, and that probably only added to the frustration of the protestors. The most dramatic moment came when Sen. Abraham Ribicoff of Connecticut, in his nominating speech for Sen. George McGovern — a Kennedy supporter who jumped into the race after RFK was killed — said that with McGovern "as president of the United States we wouldn't have to have Gestapo tactics in the streets of Chicago." The TV cameras showed Mayor Richard J. Daley shouting something at Ribicoff; we can only imagine what he said. 1980 (New York) — From the outset, conventional wisdom said that Sen. Edward Kennedy was going to dethrone President Jimmy Carter for his party's nomination. For a variety of reasons, it didn't happen. Kennedy's last gasp effort came at the convention, where his forces tried to overturn a rule that bound delegates to vote on the first ballot the candidates they were elected to support. When that failed, Kennedy's hopes for the nomination collapsed. But his dramatic, tear-inducing speech at the podium was the convention's most dramatic moment. But it was a half-hearted effort by Kennedy to join the Carter cause, one of the factors that doomed the Democratic Party's hopes of defeating Ronald Reagan in November. 1984 (San Francisco) — Walter Mondale may have been honest, if not a bit misguided, to declare at his party's convention that if elected he will raise taxes. But nothing Mondale would have said could have competed with other speakers that week. This was the first Democratic convention I attended and I was on the floor when Geraldine Ferraro, the first woman on the ticket of a major party, gave her acceptance speech. We can debate forever the importance of a vice-presidential candidate. And we shouldn't forget that the Mondale-Ferraro ticket lost 49 of 50 states in November that year. But for a brief moment, it was history, it was dramatic, and there were tears running down nearly every cheek I could find. 1988 (Atlanta) — If Clinton's nominating speech for Michael Dukakis was the embarrassing moment of the convention, the rallying moment was the keynote address by Texas state Treasurer (and future governor) Ann Richards. "Poor George," she said of the Republican nominee, Vice President George H.W. Bush. "He can't help it. He was born with a silver foot in his mouth." Another rallying cry came in the wake of Ted Kennedy's speech denouncing Bush. "Where was George?" he asked the crowd, over and over. Dukakis left the convention with a 16-point lead in the polls, but the bounce didn't last long. He carried just 10 states in November. Republicans: Sandy Adams (Fla.)*, Don Manzullo (Ill.)*, Jean Schmidt (Ohio), Cliff Stearns (Fla.), John Sullivan (Okla.). Democrats: Jason Altmire (Pa.)*, Russ Carnahan (Mo. )*, Hansen Clarke (Mich.)*, Tim Holden (Pa.), Dennis Kucinich (Ohio)*, Silvestre Reyes (Texas), Steve Rothman (N.J.)*. Q: Your amusing Tweet notwithstanding, how pathetic is it for Artur Davis to be speaking at the Republican National Convention? The only reason he's a Republican is because his own party completely repudiated him when he ran for governor [of Alabama in the 2010 Democratic primary]. — Cathy Fischer, Orlando, Fla.
A: No more pathetic than it is for Charlie Crist, who is speaking to the Democratic convention this week in Charlotte. Crist, the former GOP governor of Florida, was forced to abandon the Republican Party in 2010 when he realized he had no chance in the Senate primary against Marco Rubio. I don't mean to sound snarky, but both have decided, for better or worse, that they each have a rosier future in their new party. And their respective former parties are thrilled about the switch. Q: President Obama's comments after the Todd Akin fallout about why there should be more women in Congress got me thinking about which state has the best track record of electing female politicians to the House and Senate. New Hampshire makes an interesting case this year. Both senators are women — Jeanne Shaheen and Kelly Ayotte, and both Democratic challengers for the two respective House seats are women — Anne Kuster and Carol Shea Porter. If they were both to win, would N.H. be the first state to have an entirely all female delegation to congress? — Ben Lynn, Seattle, Wash.
A: The answer to your question about New Hampshire is yes. Maine has come close; both its senators (Olympia Snowe and Susan Collins) are women, as is one of its two House members (Chellie Pingree). But the other House member, Michael Michaud, is a man, as is his 2012 Republican challenger, Kevin Raye. Two other states have all-female Senate delegations (California and Washington), but not an all-female House lineup. As for which states have the best track record of electing women to Congress, here's how pathetic it is in the Senate. Maine has elected a total of three women (in addition to the aforementioned Snowe and Collins, there was Margaret Chase Smith). No other state, in its history, has elected that many women to the Senate. And six states — Alaska, Delaware, Iowa, Mississippi, North Dakota and Vermont — have never elected a woman to the House. Q: What's the purpose of the primaries that are held AFTER the conventions? Are there other things to vote on, such as congressional seats? If so, were there primaries for president in these states earlier? Why waste the money to have multiple elections? — Stephen Rockower, North Bethesda, Md. A: As you surmised, it's to decide the nominees for non-presidential elections, such as U.S. Senate, House, governor, state legislature, etc. It seems as if it would make sense to have presidential and down-ticket primaries at the same time, but it's not that simple. For obvious reasons, presidential primaries and caucuses must take place prior to the national conventions. Some states, such as Iowa and New Hampshire, long ago passed legislation ensuring they are first on the calendar. But at the same time, the two states have no desire to hold their congressional primaries in January, even if it would save the states money. Some states have historically held prez and non-prez primaries on the same day, such as Indiana or Pennsylvania. Others — like Massachusetts and New Hampshire, which are coming up in the next week — traditionally hold their local primaries in September. The second part focused on what Mitt Romney needed to accomplish at the GOP convention, with former presidential speechwriters Peter Robinson (Reagan) and Paul Glastris (Clinton). Podcast. There's also a new episode of our weekly podcast, "It's All Politics," up every Thursday. It's hosted by my partner in crime, Ron Elving, and me. Last week's episode had Ron in Tampa and me in D.C. Most recent winner: Denise Colvin of Colchester, Conn.
Sept. 4-6 — Democratic National Convention, Charlotte, N.C.
Sept. 6 — Massachusetts primary. This day in campaign history: Arizona Sen. John McCain accepts the Republican presidential nomination at his party's convention in St. Paul. At 72, he is the oldest non-incumbent nominee in history. In his acceptance speech, McCain promises reform and bipartisanship, and says his administration's approach will be low taxes compared to Barack Obama's plan to raise them (Sept. 4, 2008).